Flip lever to adjust height +.5"/-5.5" from mounting surface and separate pull lever adjusts tilt +10°/-15° to get to comfortable working position. ;Sturdy all-in-one wood platform minimizes bounce while typing and mousing. ;Includes easy to clean leatherette covered gel wrist rest with and Precise Mouse Pad with battery saving design that positions right or left. ;Platform swivels left and right 360° and stows completely under the desk when not is use. ;Lifetime warranty on keyboard arm, five years on keyboard platform, and one year on gel wrist rests. 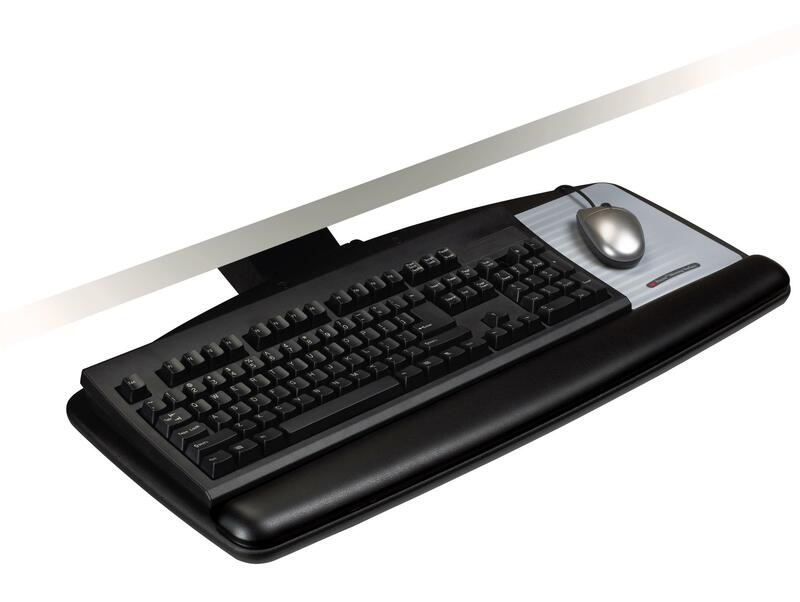 ;Required space under surface needed to mount: 26" W x 18" D. Easily adjust your keyboard and mouse to your correct ergonomic position and work in comfort with the help of a 3M™ keyboard tray.